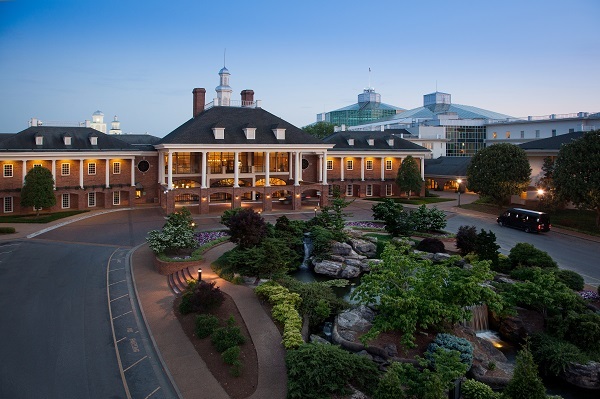 Gravitate toward your next great adventure at Gaylord Opryland Resort & Convention Center. Situated in the heart of Nashville, our luxury hotel allows you to hit all the high notes of Music City both in the area and under our roof. Looking to make a splash? SoundWaves, an upscale water experience featuring 4 acres of combined indoor and outdoor water attractions, is scheduled to open right on site in December 2018. Catch a show at Grand Ole Opry and Ryman Auditorium, then return to our 9 acres of lush indoor gardens and cascading waterfalls. We also offer a full-service spa for a more relaxing way to unwind. When it's time to refuel, sip and savor in our stylish steak, Mexican, Italian and Japanese restaurants followed by a frozen yogurt or gelato dessert. For more information on the Gaylord Opryland Resort & Convention center click here. To reserve your hotel room, please click here for the group reservations department or call 877-351-5021; please indicate that you are attending Total Solutions Plus 2019 to receive the discounted room rates. HOTEL CUT OFF DATE: September 24, 2019 at 5:00 PM Eastern. Call 877-351-5021, please mention that you are attending Total Solutions Plus 2019 to receive the discounted room rates. Room rates: $224.00 plus tax single/double per night plus a $20 Resrt Fee. All room rates are subject to local sales and occupancy tax. Reservations received after September 24, 2019 at 5:00 PM Eastern will be confirmed on a space and rate available basis only. Cancellation Policy: If you need to cancel your hotel room, cancellations must be made three days before the arrival date.